Last year was a tumultuous one for the Indian telecommunications industry. There was a dramatic increase in the number of 4G subscribers because of the disruptive entry of Mukesh Ambani’s Reliance Jio in September 2016. Data consumption went up but tariffs hit rock bottom, severely impacting the financials of incumbent telcos. The year also witnessed a wave of consolidation as smaller players including Telenor, Videocon, and Tikona were unable to withstand the hyper-competitive environment. The most significant deal to be announced was the mega merger of Idea Cellular and Vodafone India, which will create India’s largest service provider. The acquisition of Anil Ambani’s Reliance Communications’ wireless assets by his brother’s Reliance Jio was an equally important deal. The Jio-RCom merger is clearly a win-win situation for both entities. While RCom will be able to slash its debt of more than Rs 45,000 crore, Jio will gain vital assets in the form of spectrum, towers and fibre. Jio will get about 1,78,000 RKM (route km) of optic fibre, 43,000 towers and 122.4 mhz of spectrum, licensed till 2033, across the 800 mhz, 900 mhz, 1,800 mhz and 2,100 mhz frequency bands. “These assets are strategic in nature and are expected to contribute significantly to the large-scale rollout of wireless and fibre to the home (FTTH) services by the company,” R Jio said in a press statement. The spectrum could be crucial for Jio in the time to come. Its network is built on 2,300 Mhz, while most of the network it acquired from RCom is in the 900 Mhz and 2100 Mhz bands. The 900 Mhz spectrum, in particular, can help it improve its in-building coverage. As data consumption increases, telcos across the globe face the challenge of providing good in-building coverage. It can be a crucial advantage for Jio as its number of subscribers increases from the 160 million presently. However, it is in the FTTH market that RCom’s assets will help Jio. The telco giant is testing JioFiber in several markets and is likely to launch it later this year. The company already has around 3 lakh km of fibre. Combine that with the 1.78 lakh km brought in by RCom and Jio would easily have one of the largest fibre optic networks in the country. Jio will be able to cover a wider section of India’s population. The company is sure to disrupt the FTTH market just like it did the wireless market. Post-acquisition of RCom’s assets, it now owns more fibre than arch-rival Airtel (which owns around 2.5 lakh km of fiber), and this is going to be crucial to gain supremacy in the FTTH market. Besides they can use this fibre for backhaul when Jio launches the high-speed 5G network. Backhaul carries mobile traffic from base stations to core network systems and is one of the issues faced by Indian telcos. A fiberised backhaul will allow Jio to provide a better quality of service and is a significant competitive advantage for the company. Jio will also be able to bring down its operational expenditure on towers. 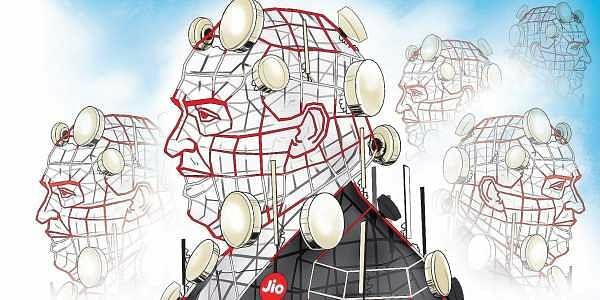 Various media reports say Jio was a tenant on around 30,000 towers of RCom. Jio will not be required to pay rental on these towers, so it will enjoy operational advantages. At the same time, Jio already had access to most of RCom’s infrastructure as part of a network-sharing agreement. In fact, Anil Ambani had at one time mentioned that RCom had ‘virtually’ merged with Jio. This acquisition is in a sense a homecoming for Mukesh who is the founder of Reliance Infocomm, the parent company of Reliance Communications. He had to give up his telecom dream because of a family feud. Once the non-compete clause came to an end, he made a dramatic entry in the vertical and started Jio. The inclusion of the enterprise segment would have been even better for Jio. Anil Ambani said in an interview with a financial daily that RCom is now going to focus on the business-to-business (B2B) and enterprise segments. He also said they are going to come with a partner over the next few months who is likely to invest around Rs 4,000 crore. Enterprise business is one of the most lucrative businesses for service providers. And this deal can be a blessing in disguise for RCom. All telcos have been trying to increase their market shares in the enterprise segment. RCom was one of the first service providers to start focusing on this segment. It has a robust infrastructure with data centres in this space. It is not very clear who is going to be its partner in the enterprise business, but definitely a nimbler RCom without the business-to-consumer part pulling it down will be a player to watch out for in this space. It was clearly a year of consolidation in the Indian market. From nearly 12-14 telecom operators in every circle, the number has dwindled to three private and one government service provider. The deal between RCom and RJio marks the end of consolidation in the Indian market. It is also the end of an era. The reduction in the number of telcos is an advantage for the remaining players, who should be in a position to increase their tariff this year. This is going to be great for the industry which has been reeling under huge debts. Most of the players are under massive debt and so an increase in tariff might bring in some stability. However, the road ahead is tough for both Reliance Jio and RCom. On the one hand, RJio will need to not just increase the number of subscribers but also increase its average revenue per user (ARPU) and RCom would be required to work to ensure that its B2B chronicle is markedly different from its business to consumer (B2C) tale.